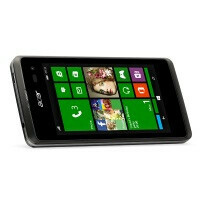 At MWC 2015, Acer unveiled a new Windows Phone 8.1 handset - the Acer Liquid M220. Upgradeable to Windows Phone 10 when the time comes, the handset offers essential Microsoft apps (OneDrive, Skype, Office, Cortana), a 4-inch display with a pixel density of 233 pixels per inch, and a pair of 5-megapixel and 2-megapixel cameras. The rest of the specs are entry-level as well - there's a 1.2GHz dual-core CPU (probably Qualcomm silicon), paired with 512MB RAM, 4GB of storage, and a 1300mAh battery. In terms of design, the dual-SIM handset can boast with its Thai Silk-inspired pattern decorating the panels, and the middle frame's pyramidal decoration. The Liquid M220 will be available in April through selected retailers in the Europe, Afica, and Middle East region. It will be sold in Mystic Black & Pure White, with a starting price of €79. 1 GB RAM or go away. Ugly chunk. No aesthetics at all. It's not better than lumia 432/435 its not meeting the WP standard's(1g of ram) even.